Irritable bowel syndrome (IBS) has been defined as a functional disorder of gastrointestinal tract without any accompanying structural defect, in which normal activity of bowel either exaggerated or distorted in such a way that it leads to constipation and/or diarrhea and frequently to abdominal pain or discomfort. It can also be described as a dysregulation of the brain–gut axis that interacts with visceral hypersensitivity and associated with observed digestive motor disturbances and microinflammation of the gut, with possibly an imbalance of the intestinal bioflora. The prevalence is known to be higher in Western countries as compared to Asian counties. The prevalence of IBS within the community is between 10% and 25%. Meta-analysis shows a pooled estimate of international IBS prevalence of 11.2% (95% confidence interval [CI]: 9.8–12.8), with variation by geographic region; the lowest occurring in South Asia (7.0%) and the highest in South America (21.0%). In the United States, nearly 20% of general population is known to be affected by IBS. In Western countries, females outnumber males by the ratio of 2:1, while female-to-male ratio in USA is 3:2. Pimparkar had observed the ratio of females to males in India reversed, i.e. 1:3 to that of the Western countries. The disorder is usually found in the age group of 15–50 years and may also occur in children and elderly. The prevalence of IBS in general population of India is 15%. Most of the patients approach the general practitioner and only 30%–50% of the workload at gastroenterology outpatient clinics. The subset who are referred to gastroenterologists represents only the “tip of the iceberg” of IBS, characterized by more pronounced symptom intensity and higher levels of psychosocial problems than patients in primary care. IBS is also associated with a markedly reduced quality of life and high utilization of health-care resources. There are very few community-based epidemiological studies on IBS in India; hence, it was planned to undertake the study. The aim of the study was to study epidemiological factors related to IBS in study population. To determine the sociodemographic variables, healthcare-seeking behavior, and its relationship with psychiatric disorders. A cross-sectional study was conducted in an urban slum among people aged between 15 and 50 years from March 2004 to August 2005. A modified version of valid bowel disease questionnaire of Mayo Foundation, Rochester, Minnesota, was used for data collection. Five hundred and thirty-eight houses were selected by systematic random sampling where every 37th house was selected for the interview. Data classification and analysis were done using Excel and SPSS software (SPSS Inc., IL, Chicago) packages. Data were classified and tabulated and tests of significance were applied wherever appropriate. IBS was seen in 12.27% of the study population with male-to-female ratio of 1.44:1. It was not associated significantly with particular gender but found more among males. The prevalence rates of IBS were 7.43%, 15.34%, 12.44%, and 17.65% in the age groups 15–24, 25–34, 35–44, and 45–50 years, respectively. Among which 86.36% patients visited a doctor at least once in the past 1 year for their symptoms and the majority (82.46%) of them visited general practitioners and 13.64% had visited a gastroenterologist. It was observed that 25.76% patients visited 1–5 times, 31.82% patients visited 6–10 times, and 28.78% patients visited a doctor more than 10 times for their bowel problems in the past 1 year. Majority (39.39%) reported they lost 1–7 days of work, 6.06% reported they lost 8–14 days of work, and 1.51% reported they lost more than 15 days of their work. Thus, irritable bowel syndrome had effect on economy as these people were mostly working on daily wages basis. The prevalence rates of IBS were 11.02%, 14.50%, 12.57%, 8.54%, and 28.57% in upper, upper middle, lower middle, upper lower, and lower economic classes, respectively (Kuppuswamy's scale). There was no significant association of IBS with socioeconomic status, educational status, marital status, or religion [Table 1]. One hundred and nine (19.7%) patients suffered from psychiatric disorders, 69 were substance-use disorders, and 37 were others such as anxiety and depression. When compared, psychiatric disorders were more among IBS patients than that of subjects without IBS and showed a significant association. Almost 34.85% patients with IBS and 8.47% subjects without IBS had sexual dysfunction and it was statistically significant among subjects with IBS. Health-related quality of life due to IBS was affected in 43.94% of subjects, and it was statistically significant among those affected with IBS. Around 46.97% subjects with IBS missed their work at least 1 day in the past 1 year, while only 6.78% of unaffected missed work. Work absenteeism showed a significant association with IBS. Pelvic pain separate from abdominal pain was reported by significant number of females (55.56%) with IBS than that of females (13.33%) without IBS. 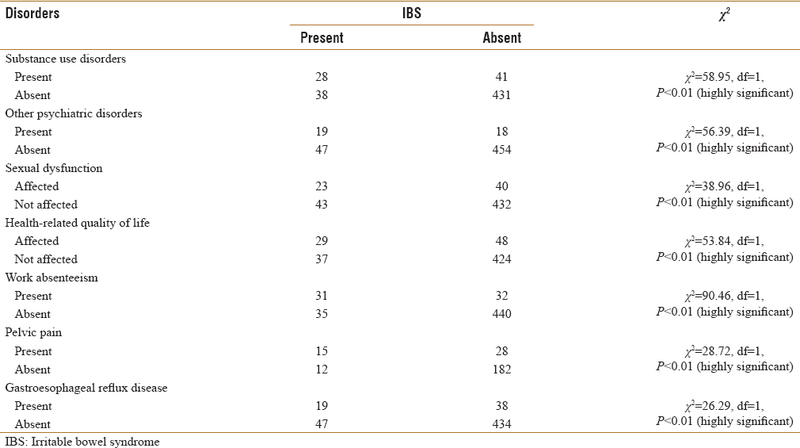 The upper gastrointestinal tract was significantly involved in IBS with 28.19% of patients with IBS reporting the presence of gastroesophageal reflux disease as against 8.05% patients without IBS [Table 2]. Diarrhea-predominant subtype was most common and alternating diarrhea, and constipation was the least common subtype among the respondents. 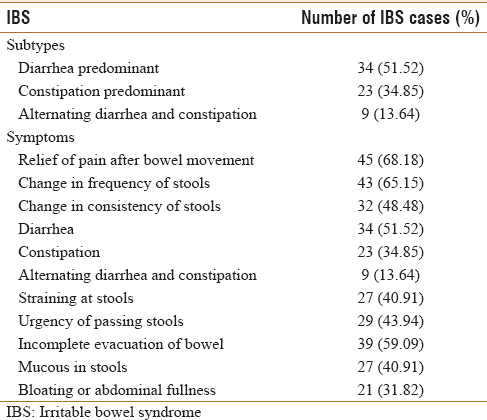 Among the IBS patients, most common symptoms after pain in abdomen were relief of pain after bowel movement, change in frequency of stools, while alternating diarrhea and constipation and bloating were least common [Table 3]. Masand et al. found a significant association between alcohol abuse and IBS, while we did not have any such association. Dewsnap et al. reported a higher prevalence of IBS among psychiatric patients (39.7%) which was twice that of the general population, while in our study, it was 28.79%. In a study by Fass et al. found that sexual dysfunction was significantly higher among patients with functional bowel disorders which was concurrent to our findings of 34.85%. Quality of life due to IBS was significantly affected among patients in our study which was concurrent to the findings of study by Wilson et al. Caballero-Plasencia et al. in a study based in Spain found that 17% of subjects missed work, while in our study, work absenteeism was significantly higher among IBS patients (46.97%). In a study by Walker et al., chronic pelvic pain was higher among females with IBS; similarly, we found 55.56% of females complaining of pelvic pain. The upper gastrointestinal tract was significantly involved in IBS as 28.19% patients with IBS reported the presence of gastroesophageal reflux disease as against 8.05% patients without IBS. We would like to thank Dr. Nutan Desai, Prof and Head, Department of Gastroenterology, LTMMC and GH, Sion, Mumbai; Dr. Daksha Pandit, Prof and Head, Department of Community Medicine, LTMMC and GH, Sion, Mumbai for their guidance and support. We would like to extend thanks to the staff and research society and ethical committee of LTMMC for granting permission to conduct the study. We appreciate the cooperation given by subjects for voluntarily giving the required information. Chua AS. 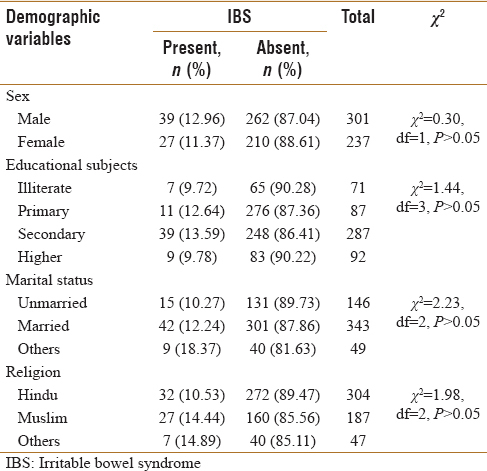 Prevalence of irritable bowel syndrome in Northern India. J Neurogastroenterol Motil 2011;17:6-8. Canavan C, West J, Card T. The epidemiology of irritable bowel syndrome. Clin Epidemiol 2014;6:71-80. Singh RK, Pandey HP, Singh RH. Irritable bowel syndrome: Challenges ahead. Curr Sci 2003;84:1525-30. Sharma MP, Chawla Y. Irritable bowel syndrome: A review. J Assoc Physicians India 1983;31:163-5. Association of Physicians India. API Textbook of Medicine. 7th ed. Association of Physicians India; 2012. p. 560. Vandvik PO. Current challenges in diagnosing and treating IBS: The importance of a positive diagnosis and a graded general treatment approach. Vol. 14. WGN; 2009. Sharma R. Revised Kuppuswamy's Socioeconomic Status Scale: Explained and updated. Indian Pediatr 2017. pii: S097475591600090. Masand PS, Sousou AJ, Gupta S, Kaplan DS. Irritable bowel syndrome (IBS) and alcohol abuse or dependence. Am J Drug Alcohol Abuse 1998;24:513-21. Dewsnap P, Gomborone J, Libby G, Farthing M. The prevalence of symptoms of irritable bowel syndrome among acute psychiatric inpatients with an affective diagnosis. Psychosomatics 1996;37:385-9. Fass R, Fullerton S, Naliboff B, Hirsh T, Mayer EA. Sexual dysfunction in patients with irritable bowel syndrome and non-ulcer dyspepsia. Digestion 1998;59:79-85. Wilson S, Roberts L, Roalfe A, Bridge P, Singh S. Prevalence of irritable bowel syndrome: A community survey. Br J Gen Pract 2004;54:495-502. Caballero-Plasencia AM, Sofos-Kontoyannis S, Valenzuela-Barranco M, Martín-Ruiz JL, Casado-Caballero FJ, López-Mañas JG, et al. Irritable bowel syndrome in patients with dyspepsia: A community-based study in Southern Europe. Eur J Gastroenterol Hepatol 1999;11:517-22. Walker EA, Gelfand AN, Gelfand MD, Green C, Katon WJ. Chronic pelvic pain and gynecological symptoms in women with irritable bowel syndrome. J Psychosom Obstet Gynaecol 1996;17:39-46.